Clustered Regularly Interspaced Short Palindromic Repeats (CRISPR) together with CRISPR associated proteins (Cas) represent the immune system of bacteria and archaea. CRISPR-Cas systems recognize foreign DNA (phage, plasmids) being able to bind and cleavage, based on a 20-30 nucleotides (nt) specific recognition (Ref. 1). The capability to reprogram CRISPR systems has lead to a wide variety of applications, being the most common one genome editing based on CRISPR-Cas9. However, many other further applications can be pursued based on this revolutionary technology. The capability to reprogram CRISPR systems to specifically target DNA has opened new avenues to develop next generation of antimicrobials, based on the capability to guide CRISPR systems to cleavage pathogens DNA. In this way, CRISPR technology will allow to specifically kill pathogens, without disrupting beneficial bacteria reducing the aside effect of current antibiotics that kill both, beneficial and pathogenic microorganisms, and also minimizing the spread of antibiotic resistance genes. The use of this molecular tool, based on a 20-30 nt specific DNA sequence (protospacer), and the need of a Protospacer Adjacent Motif (PAM, general 3nt) transform this technology in the most accurate and precise, reducing to a minimum extend the risk to target beneficial bacteria or human cells. While genome editing its based on the use of the endonuclease Cas9 (CRISPR Type II), the antimicrobial platforms has been develop based also on the exonuclease Cas3 (CRISPR Type I) as the exonuclease activity it is suppose to be more letal. Cas9 make a unique double strand DNA cleavage whereas Cas3 cut only one strand but continue “chewing” the DNA as a “packman” making a lethal damage. No matter which CRISPR system is used, we can design one or more protospacers targeting a vital gene of the pathogen to destroy its DNA and kill it (Figure 1A). Moreover, protospacers can be design against the antibiotic resistance genes, usually encoded in plasmids. So on, the plasmids will be destroy avoiding the spread of the antibiotic resistance to other bacteria, while at the same time the bacteria will be again sensitive to the standard antibiotics (Figure 1B). There are still some limitations for the application of this promising technology. The limitations rise in the efficient deliver of CRISPR inside of the pathogenic bacteria to cleavage the DNA. Most of the current strategies are based on the use of phages (virus that infect bacteria) that recognize a specific bacteria, get attached and inject the CRISPR systems inside. However phages have a reduce host range, meaning they will not be able to recognize more than one or a few strains. This is a limitation to generate broad spectrum CRISPR-antimicrobials, but at the same time, it adds more specifity to the system in the first step of recognition and interaction between phage-bacteria, ensuring the phage will only deliver the CRISPR-killing tool to the pathogenic strain. So on, phage engineering needs to be develop to encode in the phage DNA a CRISPR array and putatively, to increase phage range hosts. Several studies has shown the capability to use CRISPR to specifically eradicate pathogens that cause skin infections in animal models (Ref. 2). Skin infection is the “easy” and desire therapeutic application as CRISPR can be easily deliver, but most of the attention in the develop of new antimicrobials is focused on targeting intestinal pathogens like Clostridium difficile, Shigella or Salmonella. In these case, the limitation is to be able to efficiently deliver CRISPR to survive the harsh conditions of the gut. We can argue then that CRISPR is a promising technology that will develop next generation of antimicrobials, with a proof of concept already done, but still many research needs to be done focus on the deliver platforms. CRISPR will solve the two actual problems of antibiotics: (1) multidrug resistant bacteria and (2) the non specific action of actual antibiotics that kill pathogens but also commensal bacteria. Hopefully, legal regulation policies will be re-consider and upgrade, allowing the use of CRISPR to improve human health. 1. Citorik R.J., Mimee M, and Timothy K. Lu. “Sequence-specific antimicrobials using efficiently-delivered RNA-guided nucleases.” Nature Biotechnol. 32(11): 1141-5. (2014). PubMed: PMID 252409288. PubMed Central: PMCID PMC4˚237163. 2. Bikard D. et al. “Exploiting CRISPR-Cas nucleases to produce sequence-specific antimicrobials.” Nature Biotechnol. 32(11): 1146-50. (2014). PubMed: PMID 25282355. PubMed Central: PMCID: PMC4317352. 3. Beisel C. L., Gomaa A, and Rodolphe Barrangou. 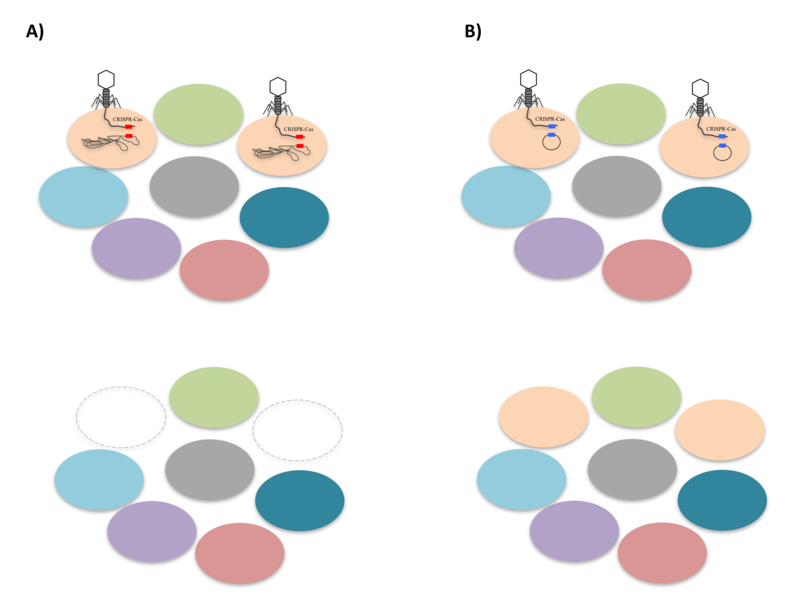 “A CRISPR design for next-generation antimicrobials.” Genome Biol. 15(11):516. (2014). PubMed: PMID 25417800. PubMed Central: PMCID PMC4282009. 4. Yosef, Ido, Miriam Manor, Ruth Kiro, and Udi Qimron. “Temperate and lytic bacteriophages programmed to sensitize and kill antibiotic-resistant bacteria.” Proc Natl Acad Sci U S A. 9;112(23):7267-72. (2015). PubMed: PMID 26060300. PubMed Central: PMCID PMC4466736. 5. Ando H, Lemire S, Pires D, and Timothy K. Lu. “Engineering Modular Viral Scaffolds for Targeted Bacterial Population Editing.” Cell Syst. 1(3):187-196. (2015). PubMed: PMID 26973885.